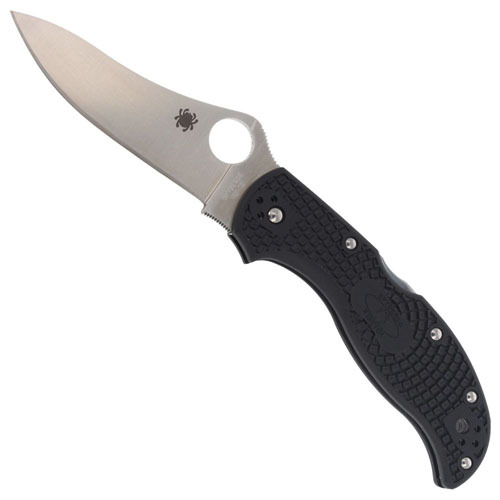 The Spyderco Stretch has changed over the years much like watching one of your kids grow up. What started as a small basic Hunter model in the 1980s matured/stretched into an elegant high performance drop point folder available in a variety of handle materials and blade steels. The latest is a lightweight model with a black FRN (fiberglass reinforced nylon) handle. The VG-10 modified drop-point blade is ground thin and fully-flat with an arcing belly, installing itself as a winner for outdoor endeavors and carrying everyday. Turned-out with a mid-spine positioned back lock the FRN handle is injection molded and surfaced with Bi-Directional Texturing When the palm meets the texturing tactile resistance results, stopping in its tracks forward or backward sliding under harsh, wet or slippery cutting circumstances. The steel pocket clip screws into pre-drilled holes on both sides and both ends of the knife making four possible carry options: left/right-handed and tip-up or tip-down.